Heat oven to 425°F. Line large cookie sheet with nonstick foil, or if using regular foil, spray foil with cooking spray. In large bowl, mix oil, dill pickle juice, dill weed and garlic. 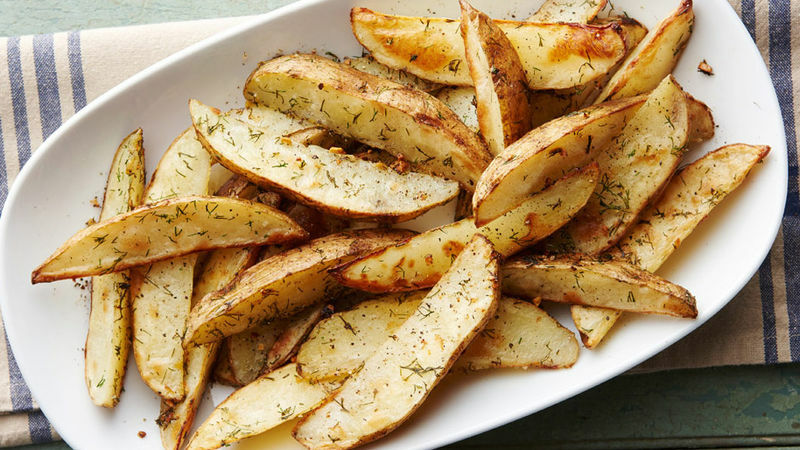 Add potato wedges; toss to coat. Spread potatoes in single layer on cookie sheet; sprinkle with salt and pepper. Bake 35 to 40 minutes, turning after 20 minutes, until potatoes are golden brown and tender. Sprinkle with additional pickle juice, if desired. To easily cut the potatoes, cut in half lengthwise; place flat side down on cutting board, and cut into 8 wedges. Fresh dill weed definitely tastes the best, but if you don’t have it on hand, you can substitute dried dill, using 1 1/2 teaspoons in place of the fresh.